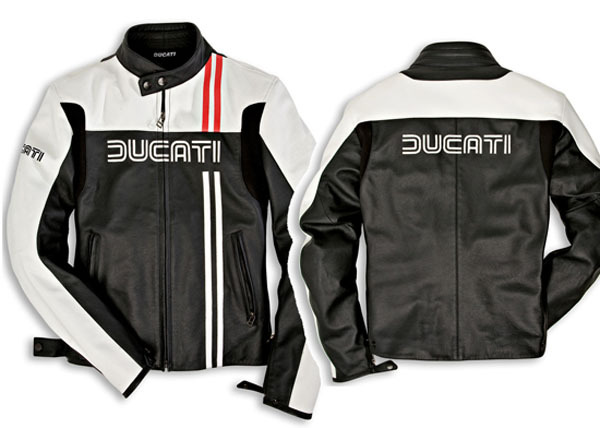 A black & white 2010 all new leather jacket is always the perfect choice to wear on and off your bike. This simple and elegant jacket has all the modern technical protections perfect for riding. The Ducati logo designed by Giugaro and originally used in the 1980s is printed in large letters on the front, with one smaller logo on the upper lower right sleeve. White stripes add a crisper look to an otherwise black background. This jacket has removable CE approved protections on the shoulders and elbows and for a back guard, a sanitised long lasting THINSULATE 3M ZIPOUT lining, an adjustable hip fastening and stretch panels to improve movement. This jacket is a reproduction and has removable CE approved protections on the shoulders and elbows and for a back guard, a sanitized long lasting THINSULATE 3M zipout lining, an adjustable hip fastening and stretch panels to improve movement. This jacket combines retro taste with superior riding apparel. All labels and logo stitched and ebmroided suitable for all weather conditions. Double & Triple stitched stretch panels in the arms, shoulders for comfort and ventilation. Water-resistant black 3M Thinsulate removable lining. Discreet Pockets with hidden zippers for keys, wallets - 2 inside. Inside back zipper 8 inch to connect. Highest quality materials and craftmanship with double and triple stitch seaming. 120mm Side zippers on wrists and heavy duty grade front zipper all top YKK brand. Adjustable waist sides allow for custom fitting to your personal preference.